Supergeo has launched SuperGIS Server 3.1 Value Edition, the enterprise-level server software, and SuperGIS Server 3.1 has successfully been applied on diverse domains such as telecommunications industry, education and academic organization, public sectors and so on. To provide more comprehensive services in geoprocessing, SuperGIS Server 3.1 Standard Edition will be released to support new Geoprocessing service. Geoprocessing worked with Service means that the functions can be utilized by multiple clients. And the design of geoprocessing functions and the preparation of input spatial should be arranged at the Server side in advance. Therefore, requests from clients can be accepted and conducted by the Server. The advantage of using Geoprocessing Service is that, via the Internet every user can utilize Geoprocessing functions published by SuperGIS Server, even though they neither install SuperGIS Server nor the relevant software in computers. This function could be one of the important features of Cloud GIS. The picture below shows the manipulation interface of SuperGIS Toolkit. Including hundreds of classes of Geoprocessing functions, SuperGIS Toolkit is the tool that SuperGIS Desktop users can use. However, the usage of some functions depend on the authorization of SuperGIS Extensions. For example, users who obtain authority of spatial analyst can apply all the functions in Spatial analyst. SuperGIS Toolkit now consists of hundreds of functions like 3D Analysis Tools, Spatial Analysis Tools, Conversion Tools, Data Management Tools, Property Processing, Statistics Tools and so forth. 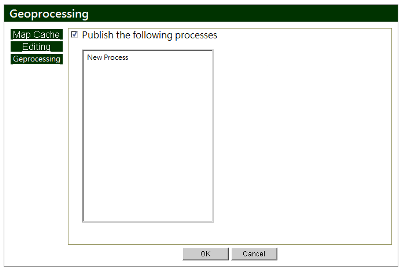 Besides the plentiful built-in Geoprocessing functions in SuperGIS Toolkit, users can also utilize the sub tool, Process Designer, to customize the workflow of Geoprocessing. In some cases, the procedure of geoprocessing usually involves more than one geoprocessing function. Sometimes, the input might need to be converted before the next process. For example, it is assumed that we have polygon data of a cadastral map and distribution information of realtors. Now we can design a Geoprocessing Task for front-end users to select one realtor position and enter a distance value to generate a Buffer extent, and then calculate the buffer extent to obtain the intersection of the Buffer zone and the cadastral map. After that, users can get the area value of the intersected area. Designing the workflow with graphics enables service providers to view the design thoroughly. Service providers need no coding during designing the Geoprocessing Task, but select the input and output file path in sub tool items and determine which parameters for front-end users to enter during manipulation. After completing these conditions, the Geoprocessing Task will be saved in the map project file (*.sgd) of SuperGIS Desktop. Setting items of Geoprocessing Service is subsidiary of setting interface of Map Service. After selecting the specified map project (*.sgd) for publishing, service providers whose SuperGIS Server includes Standard Edition will be able to enter the interface of Geoprocessing settings. Service providers can view all of their own designed Geoprocessing Task and decide which to publish. Service providers have to customize the map page after publishing the specified Geoprocessing Task in the map project. Thus, clients will be able to manipulate the published functions on the interface. (Please refer to the picture below.) Our manual also provides simple sample code for developers to customize the program to call the Geoprocessing Task provided by Server. On a traditional GIS platform, developers are usually occupied in fulfilling the requirements of customizing functions and writing codes. 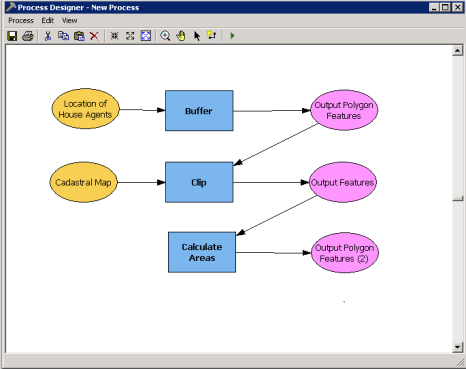 However, through Process Designer of SuperGIS Toolkit, developers can design the required Geoprocessing Task by manipulating graphical interface and save time on customizing and coding. Additionally, one important feature of Cloud GIS is that service providers are allowed to publish Geoprocessing Service and share this function with more users via SuperGIS Server. 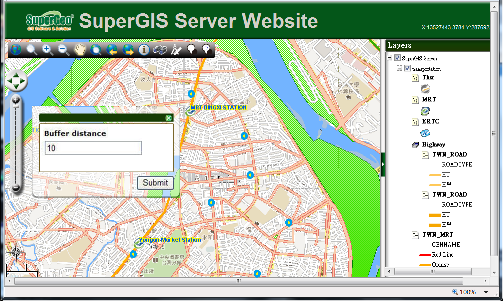 SuperGIS Server Standard Edition will be launched in Q4 of 2012. To know more product information, please visit SuperGeo website.